By now if you've experienced a Denis Villeneuve movie (Prisoners, Enemy, Incendies), you'll know that the director revels in walking a tight line between morally dubious and criminally wrong. Sicario, his latest feature, is a scathing and uncompromising look at the so-called "war on drugs", and it's made painfully clear that there are no real winners in this endeavour. Emily Blunt plays FBI agent Kate Macer, who is recruited onto an inter-agency task force that may or may not involve elements of the CIA, DEA, and FBI. 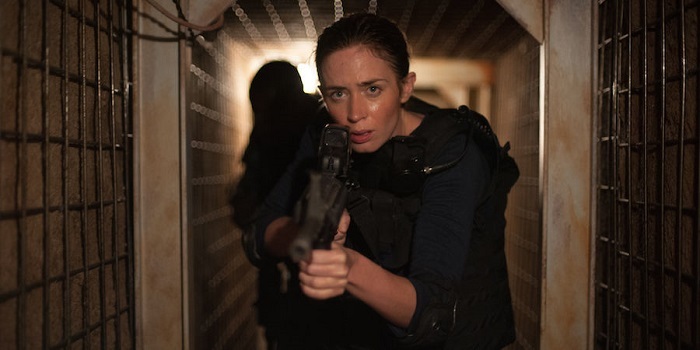 She's unclear why she is recruited, only that the task force appears to have the same goals as her in taking down a cartel leader whose carnage she's been dealing with on the US side of the border. Along the way pop up Josh Brolin as a shady top tier government agent seemingly in the know and Benecio Del Toro, a stoic, mysterious figure always lurking in the background wherever Kate treads, and whose motives remain shrouded and alliances unclear for a large part of the movie. Villeneuve intelligently uses these characters like pawns on a chessboard, casting a critical eye on American policies in fighting the cartels, and shining a spotlight on the lawlessness perpetrated by both sides of the battle. While the plot may seem dense and politically daunting at first, the action is rarely far from the frame. Horrific, gruesome and at times shockingly brutal, the violence that punctuates the story is extremely effective at selling just how dangerous this campaign is. Whether it be a protracted shootout on a busy roadway or a family dinner that descends into a bloodbath, Villeneuve once more proves that he is masterful at orchestrating disturbing and unsettling scenes of destruction. Blunt is brilliant in her role, and it's testament to her abilities that her director fought the studio to give her the lead. Intelligent and tough but simultaneously naive and vulnerable when she steps into the world south of the border. Equally as good is Del Toro, a man who suffers nightmares and whose languid movement and apparent sadness betray the cold and efficient killer that lies beneath the surface. The real star of the movie though is cinematographer Roger Deakins, who makes spectacular use of the dusty Mexican locale and sweeping aerial photography to lend every shadow a more sinister note, and whose nighttime shots are both haunting and incredibly tense. 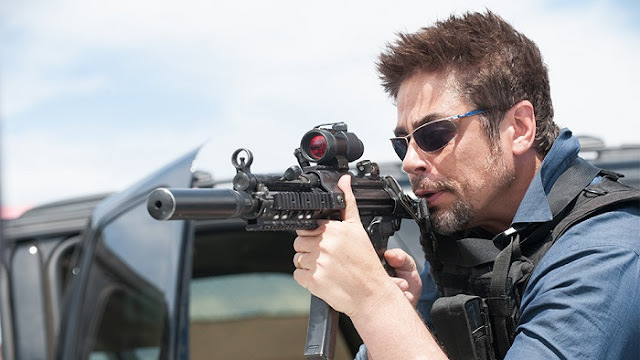 Sicario is easily the best crime thriller of 2015, it's unrelenting sense of dread building from the very first scene. Bleak and murky, it is Villeneuve's most daring, ambitious and complex film to date and delivers tightly wound suspense unlike anything else you're likely to see in a cinema this year. A remorseless, claustrophobic masterpiece.